At this year’s PRIMEX East, in an interview with WhatTheyThink.com, Marriott Winchester of the SGS Group described the new rules. Over the next 2-3 years, these rules will radically change the familiar Nutrition Facts Panel—required on nearly all food products sold in the United States. Compliance will not be required right away. But Winchester warned that the new FDA packaging rules will significantly impact every aspect of the food industry. He said the regulations represent “the most significant generational event in the food and beverage industry that we’ve seen” since placing nutritional information on labels was first mandated 23 years ago. In a word: everything. SGS is partnering with Prime Label Consultants, a Washington, D.C. advisory group, to help clients manage the transition to the new label requirements. The task is formidable. The new rules will disrupt years of food packaging strategy, requiring the removal of nutritional claims (or the reformulation of the product) and a significant re-design of nearly every product package. For starters, the new panel is larger, in some cases twice as large as the old one. This is due in part to the requirement (in some cases) of a second, per-container column. The way ingredients are described is also different, such as the “added sugars” figure. The way dietary fiber, sugars, and other nutrients are reported are subject to FDA verification. That means claims like “low-fat” or “high-fiber” may need to be removed until the product is reformulated. This affects claims anywhere on the package—not just the Nutrition Facts Panel. SGS and Prime Label are helping clients manage the transition with their internal business process. This includes content management and compliance reporting. However, it will also impact package design significantly. Because the new panels are so different, simply replacing them is not an option. (See figure below.) A vast majority of existing packaging will have to be re-designed—and the printed nutritional claims brought into compliance. With traditional package design and production systems, this flood of redesign work will be overwhelming. It will hinder new product package development. Thankfully, relief is available. With Internet-enabled 3D packaging design—iC3D—the process will be much more efficient. In iC3D, PDFs of both old and new Nutrition Facts Panel (NFP) can be applied to virtual package models in real time. Like the older version, the new NFP may not be re-sized, legally. This means that years of package design optimization will have to be discarded and new designs created for millions of packages. Nutritional claims made outside the NFP will also have to be changed. Only iC3D provides immediate visual feedback on these design challenges and possible solutions. For existing packages, the new Nutrition Facts panel can be imported, and necessary design adjustments made. Then the 3D model is rendered in real time. 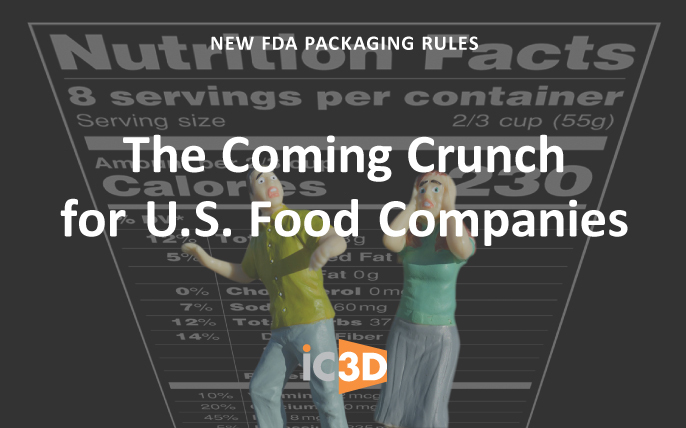 Using iC3D’s included Internet viewer, those concerned with FDA compliance can view the changes from any angle, and approve the redesign without unnecessary delay or manual steps. The new FDA packaging rules will undoubtedly kick off a worldwide overhaul, as consumer advocacy groups outside the U.S. lobby governments for more standardized, consumer-friendly nutritional labeling. This will lead to a rise in compliance-related costs throughout the supply chain, including brand owners, package designers, printers, and converters. Fortunately, with iC3D, the design and ideation part of those costs can be controlled.